the 2nd stage of the African Cycling Cup 2018 Time Trial Eritrean cyclists in both men and female categories won gold medals. 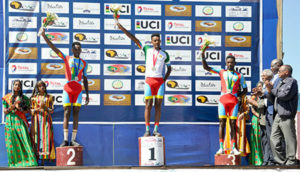 From the men category Sirak Tesfom, Aron Debretsion and Daniel Habremicael members of the Eritrean national team won the Gold, Silver and Bronze medals respectively. From the females category Adiam Tesfa’alem member of the Eritrean national team won Gold medal while Mihret Gebreyohannes member of the Ethiopian national team and Liezel Jordaan member of the South African national team settled for Silver and Bronze medals respectively. The African Cycling Cup 2018 which is the first of its kind will be conducted until Sunday, 25 November in Eritrea.